Researchers from the University of Leeds and Sheffield University have created a way to move data through magnetic nanowires by using surface acoustic waves as the motivating force. Being developed for use in so-called racetrack solid-state memory, the researchers claim that using sound waves for data transfer should markedly increase computer processing speeds while vastly reducing power consumption. Developed by IBM, racetrack memory (where data runs up and down a track of wires like race cars, hence the name) uses the transition between different magnetic moments (directions) in the domain walls separating each of the magnetic areas found in the nanowires that make up the memory. As each transition between these areas results in an angular displacement (a change of magnetic “direction”) of 90 or 180 degrees, the racetrack memory allocates a one or zero to each of these changes to represent binary data along the length of the wire. To move bits of data through these minuscule magnetic wires – 20 times smaller than a human hair – strong magnetic fields and induced electric currents are usually used to overcome the magnetic inertia encountered in the domain walls. However, these transfer methods are somewhat inefficient in terms of heat production and power consumption than the increased data speeds readily justify. Looking for a way to overcome these power inefficiencies, Dr Tom Hayward from the University of Sheffield and Professor John Cunningham from the University of Leeds together hit upon the idea of manipulating magnetic domain walls by passing two counter-propagating surface acoustic waves (SAW) across the piezoelectric substrate to which the nanowires are fixed. 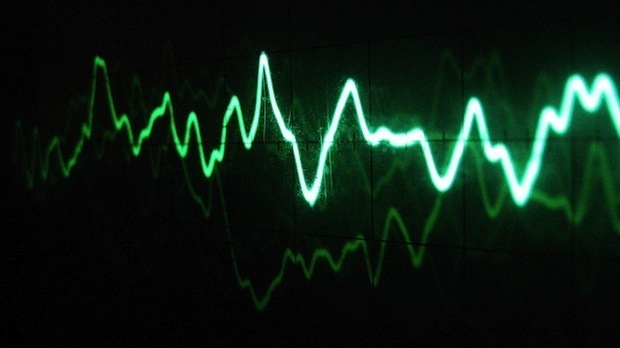 In other words, the researchers sent two sound waves across the surface of a racetrack memory in opposite directions. Where the sound waves met, a standing acoustic wave was formed which was then used to isolate and manipulate the arrays for the more efficient movement of energy across the magnetic domain walls. This is because, at the antinodes of standing stress/strain waves, the domain walls become attracted to and pinned at these points and the data moves along the wires in a ratcheted motion toward positions where stress gradients are minimized. In this way, multiple domain walls can be synchronously propagated at high velocities by shifting the frequency of the SAWs. This essentially means that the researchers discovered that the direction of data flow could be altered by changing the pitch of the sound created so, in a sense, the researchers “sang” to the data to move it. The results of this research were recently published in the journal Applied Physics Letters.